Joshua Catherman uses electronic cigarettes at work—discreetly. The 32-year-old meat cutter at a Tampa, Fla., supermarket is reluctant to ask his employer for permission to "vape" indoors. When he is sharing the tiny break room with co-workers, he asks if they mind if he uses an electronic cigarette, which converts a nicotine or nicotine-free liquid into vapor. If the answer is no, he pulls out his device and takes a long drag of flavored liquid mist. "I blow out a Bavarian cream vape, and it smells like Christmas at grandma's house," he says. The one time a co-worker walked into the break room and objected to his e-cigarette, Mr. Catherman quickly put it away. "I don't want to lose my job," he says. To puff or not to puff? Vaping at work is, so far, a hazy issue for most workers and their employers. While companies want to support workers' efforts to quit smoking, they are unsure about inviting staff to flick on the battery-powered e-cigarettes in the office. Exxon Mobil Corp. allows vaping in smoking areas, while CVS Caremark Corp. bars workers from using regular or e-cigarettes at its corporate campuses. E-cigarettes aren't allowed for customers or workers at Starbucks Corp. and Wal-Mart Stores Inc., but vapers—both patrons and workers—are welcome at McDonald's Corp. restaurants. United Parcel Service Inc., which charges nonunion tobacco users $150 extra in monthly insurance premiums, opted to make e-cigarette users pay the higher price, too. Twenty-four states and the District of Columbia ban smoking in the workplace, but only three—New Jersey, Utah and North Dakota—have added e-cigarettes to those laws. And while more than 100 cities forbid vaping in areas where regular cigarettes are already banned—including Chicago, where city aldermen voted on Wednesday to restrict e-cigarette use—most haven't addressed the issue, leaving employers to make their own decisions. Employers' choices are complicated by the fact that public-health experts can't agree on whether e-cigarettes are a valuable tool for helping smokers kick the habit or simply a milder—but still potentially harmful—alternative to regular cigarettes. Most vaping liquids contain nicotine, the addictive agent in cigarettes. Scientists largely agree that e-cigarettes emit far fewer toxins than traditional cigarettes, but critics, including public-health officials and health advocacy groups, contend that secondhand vapor is a pollutant and more research is needed to understand its health effects. Some workers simply find vaping unsettling. Last month Idaho's Bannock County, population 88,000, banned e-cigarettes from all county buildings, including the courthouse, county jail and fairground facilities, after courthouse employees complained about indoor vapers. "They felt like it was disruptive, more because of how it looked than anything," says Howard Manwaring, a county commissioner. Many versions of e-cigarettes closely resemble regular cigarettes, right down to their glowing tips. The county hasn't extended the ban to private workplaces or restaurants because commissioners don't have enough information yet about the health effects of vaping, Mr. Manwaring says, adding, "We will leave it open to revisit in the future." Cigarette smoking in offices seems like a relic, but it was only in 1994 that the Occupational Safety and Health Administration proposed a broad smoking ban that would have applied to more than a million workplaces. The agency's regulators received death threats in response and the proposal was eventually abandoned, partly because employers had begun adopting their own bans. By 2007, 91% of U.S. employees were subject to smoking-restriction policies, according to a report from Pfizer Inc.
Business owner and nonsmoker Carol Keiling elected to allow e-cigarettes during lunch hours after an employee approached her two years ago about vaping in the office. Ms. Keiling, president of Safety Harbour Insurance Inc., in St. James City, Fla., now lets workers vape freely unless a customer is present. 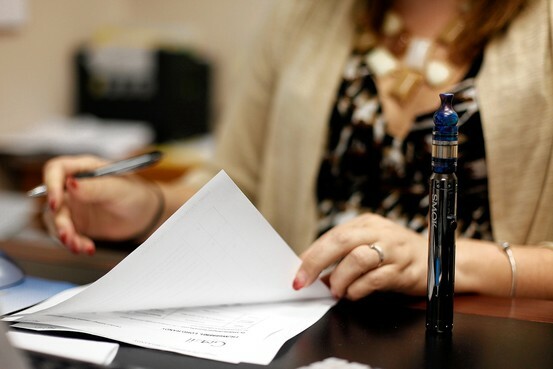 Three employees—all former tobacco smokers—use e-cigarettes. "It didn't seem to pose a danger to anyone, so I gradually loosened the rules," she says. She quickly noticed that the "cacophony of coughing" that filled the office every morning disappeared soon after the smokers switched to e-cigarettes. Productivity rose, too, she says. Of the one employee who stuck with tobacco cigarettes, she says, "I feel like I lost over an hour a day of paid time to his smoking." Ms. Keiling tried to regulate his smoke breaks, but laid him off in May, partly because of low productivity. The Food and Drug Administration is considering restrictions on the sale and marketing of e-cigarettes, and may release its recommendations in the next few weeks. That proposal could "eliminate some of the uncertainty as to whether e-cigarettes should be grouped as tobacco products that are harmful," says Jay Hux, an attorney at employment law firm Fisher & Phillips LLP. "That's a narrative employers should be aware of." The FDA's actions are being closely watched, since any proposal from the agency will add to the growing debate over the devices, which are seen by some in the industry as the future of the $100-billion-a-year U.S. tobacco market. E-cigarette companies have drawn big-name investors, including tobacco giants such as Altria Group Inc. and Reynolds American Inc.
For now, many vapers say they will puff in stealth. Shelley Bain, 55, quit her 30-year pack-a-day habit in October after switching to e-cigarettes. At the federal agency where she works in Bethesda, Md., she occasionally slips into the bathroom for a quick hit on her e-cigarette. When she does so, Ms. Bain says she inhales, then counts to 15 so almost no vapor escapes when she exhales. Mostly, though, she takes her device outside and huddles with the smokers. Though she doesn't know if her agency has an official policy on e-cigarettes, she says, "I don't want to get into the whole mess of trying to argue about it with people inside.